Lionel was born in Stirling, South Australia on 11th of June 1932 and died on the 22nd of September 2004 aged 72 and was one of seven children. His father and uncles competed in woodchopping events as did Lionel’s three brothers. His brother Bob has also been inducted into the Hall of Fame. Lionel moved around Australia and worked most of his life in the bush as a tree feller and log truck driver. He moved from Adelaide to Tarpeena, South Australia to Warragul, Victoria to Cann River, Victoria, back to Adelaide then to the Northern Territory and Queensland. He passion was the bush and his trucks and unfortunately a trucking accident in 1981 meant he had to retire from the sport at 49 years of age. Lionel competed in woodchopping and throughout South Australia and Australia. In 1962, he won the Grand Aggregate Trophy at the Royal Melbourne Show. Lionel was a renowned underhand cutter and was also an excellent tree climber. Bill Youd often referred to Lionel as “a blood good little tree climber”. He did however become the South Australian Champion in the Underhand event 8 years in a row from 1973 to 1979 and he won the South Australian State Championships in the Standing Block in 1977 and placed 4 other times mostly beaten by his brother Bob. 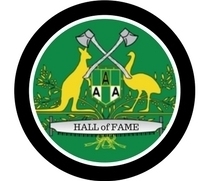 They had a fantastic rivalry during the 1970’s with Lionel being the South Australian State Champion in the Underhand and Bob the South Australian State Champion in the Standing Block.